WASHINGTON (CNS) — Father Leo Patalinghug, known by many as the cooking priest, demonstrated for Catholic News Service how to make a Lenten meal that he described as “super quick” with delicious flavors that also goes along well with the Lenten theme of simplicity. “It can’t get any simpler,” he said of the pasta and shrimp dish with smoked paprika, which he said can bring families together to celebrate Lent and to talk about the purpose of the liturgical season. 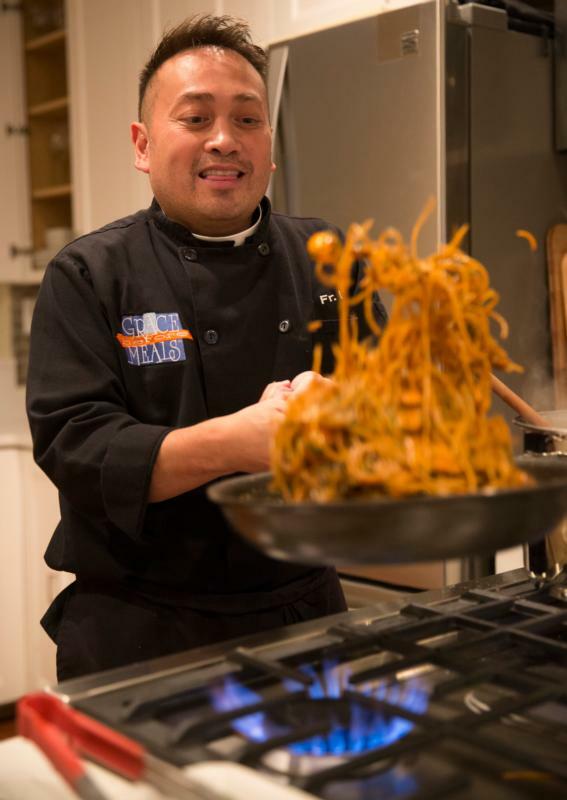 Celebrity chef Father Leo Patalinghug demonstrates how to cook a Lenten seafood pasta meal in his Baltimore kitchen Feb. 24. (CNS photo/Chaz Muth). Cook pasta according to instructions and reserve 1/4 cup of starchy water. Put aside. Melt butter until at smoking point. Add garlic and saute. Add smoked paprika and cook, then add tomatoes, some chopped parsley and shrimp, and cook a few more minutes. Add the pasta and mix all together. Add salt and pepper to taste and add water if necessary. Sprinkle with rest of parsley. Serves four.